The members of RTP Corvettes lived up to the club slogan – Ready to Party! There were whispers of a couple club members who just couldn’t stop laughing at the Friday night dinner at Putter’s. Reliable sources stated that one club member introduced a couple of the others to a new adult beverage. 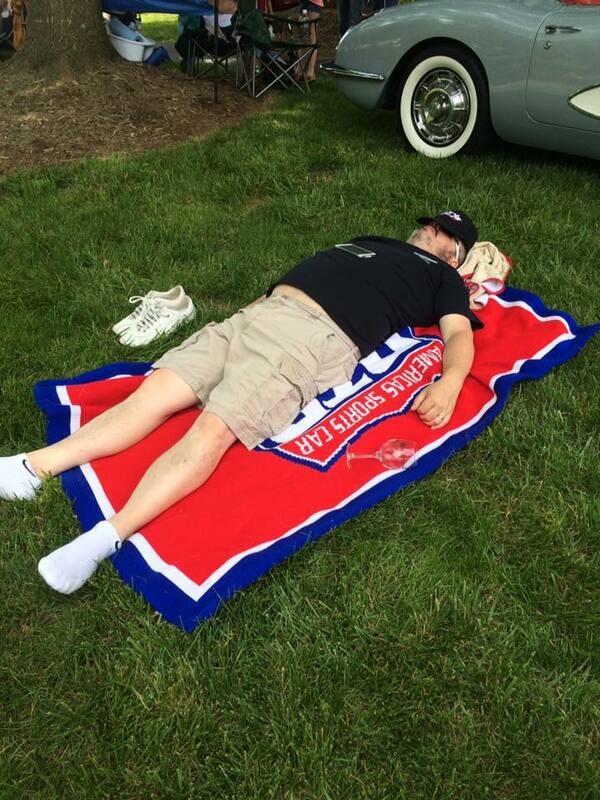 And then there was the photo making the rounds on Facebook of a club member “sleeping it off” on the grass during the show the next day. Names are not being mentioned to protect the not so innocent. Seriously though, it was another great event attended by club members. For those who have not been before the setting is spectacular. Hundreds of Corvettes parked on the grounds of the vineyard. The wine tasting room is open for everyone and if you pre-ordered your wine – you received commemorative wine bottles labeled with the Corvette logo. Another big plus of this particular show is that a free shuttle runs between the hotel (Hampton) and the vineyards every 15 minutes. So if one member of the couple traveling together wants to sleep in a little late while the other goes to the show – no problem. 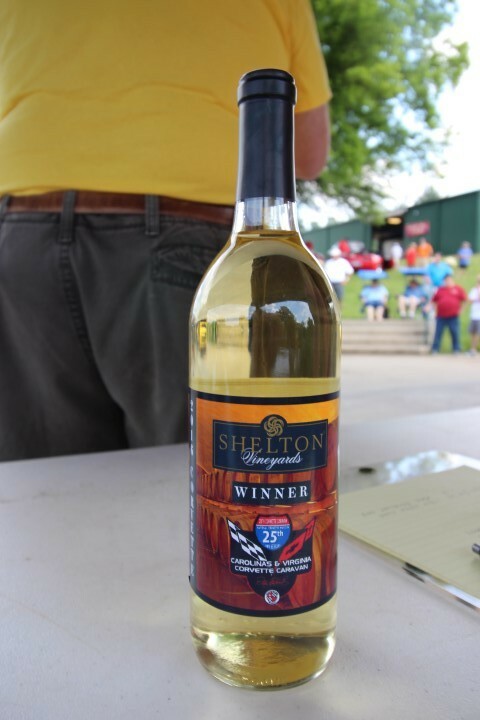 Shelton vineyards gave out 48 awards – and the award was a commemorative bottle of wine – not too bad. Club members who won awards included: John & Donna Salter, Paul & Kelly Archambault, and Tom & Jeannie Meyer. The two cars awarded the Shelton Vineyard “picks” were club members: Todd & Tena Crook and Mark Sturdivant. Pete Perolini won the 50/50 ($194) and Bob Cormier won a $100 gift certificate from Dale Earnhardt Chevrolet. Congratulations to all the winning club members! Frank Sancineto’s closing remarks on the day of the show really resonated with the crowd. “Remember we are here for Memorial Day to remember those who died in the past and those who protect us now.” Well said Frank!